Boost your productivity on the road with this ultra-portable Bluetooth wireless keyboard and tablet stand for all iPad models, and all other mobile tablets, both full-size and mini. Slip the Blu-Link keyboard from its travel case and, using the case as a portable stand, utilize your iPad or other tablet like a workstation, anywhere. 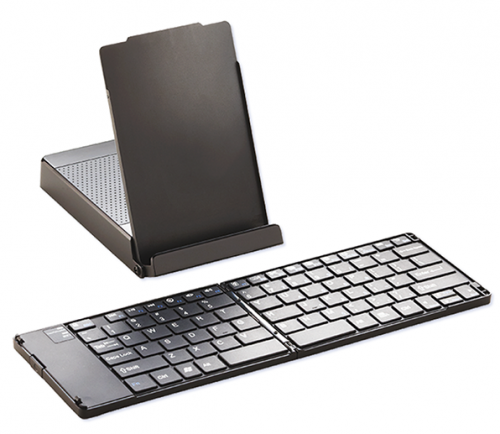 The Blu-Link Folding Bluetooth Keyboard and Tablet Stand is an ultra-portable folding wireless keyboard for iPad or other full- or mini-sized tablets and smartphones. Slip the Blu-Link keyboard from its travel case and, using the case as a portable stand, utilize your iPad or other tablet like a workstation, anywhere. Boost your productivity with the Blu-Link Folding Bluetooth®Keyboard. 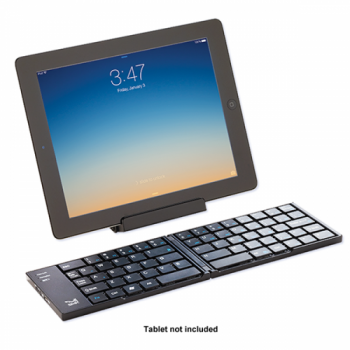 Featuring full-sized keys, it makes typing on your tablet a breeze. And when you’re ready to wrap up, this ultra-portable keyboard folds up, magnetically seals and slides into its travel case, slipping easily into your brief case, backpack or travel bag. Ideal for email, text and Internet applications.